Who is the function coordinator and what are her normal office hours? Will Southers Marsh help me plan my wedding? When can I get in to set up the room? What is included for my wedding? What days and times is Southers Marsh available for weddings? What happens if there is inclimate weather? What is the capacity at Southers Marsh? Can I rent the space and bring my own food or beverages? What are my options for wedding ceremony sites? What are my options for wedding pictures? Will the facility be available for a ceremony rehearsal? Is there a bridal changing area? When is the farmer's porch normally enclosed? What if I have unique ideas for my wedding? How much can I expect to pay for my wedding at Southers Marsh Golf Club? What deposits are required to hold a date? Are the prices subject to change? Why is there a cake service fee? Why is there a pricing difference between weddings and other functions? Our function coordinator is Laura Stearns Flynn. Laura knows our entire operation from top to bottom, being a member of the Stearns family, and holds the distinction of being the first person to ever get married at Southers Marsh. She available by email at weddings@southersmarsh.com and is also available by appointment at your convenience. If you need to talk to someone immediately, please call 508-830-3535 and ask for Sarah Bramhall or Will Stearns. 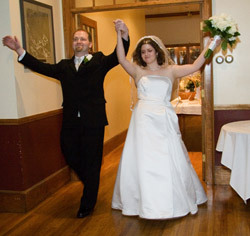 We will do everything we can to help make sure your wedding goes off exactly how you envision it. Laura and Owner-General Manager Will Stearns will be happy to assist you in determining your menu, event timetable, floor plan, vendor choices, and more. Unfortunately, there is no absolute guideline on when the facility will be available for you to set up. There are a variety of factors involved including our schedule before your event and what part of our facility you will be using. We will make sure that there is enough time for everything to be arranged to specifications, and Laura will be able to determine more precisely when the room will be available based on previous experience. Standard room set-up and takedown, flexible layout of your choosing, large on-site parking area, proficient and hospitable wait staff, experienced bartenders, sixty-inch round wooden tables seating 8 people, linen tablecloths and napkins in your choice of colors (some colors may be an additional charge), wooden dining chairs in the clubhouse, white vinyl chairs in the tent, all tableware and glassware, use of our sound system, and hurricane or votive candle centerpieces. Please be aware that some pictures may include optional items that are available at additional cost or from outside vendors. Your reception may last up to five hours. If you are having an onsite ceremony, you may add an additional half hour for a fee to offset the additional staffing time. All events must conclude by midnight. The bar will be open for a maximum of 4 1/2 hours. What days and times is Southers Marsh available? In general, from May through mid-October, Friday nights are reserved for golf tournaments and Saturday nights are reserved for weddings and large functions. Please see our wedding minimums below. Southers Marsh is closed for functions on Easter, Thanksgiving, Christmas Eve, and Christmas. For Saturday events in May through September, we request that they start at 4 PM or later. In the case of bad weather, we can move the outdoor portions of your event inside or make other arrangements. In extreme situations, Southers Marsh reserves the right not to put up or allow use of the tent if it will be unsafe or potentially damaging to do so. The dining room has a capacity of 112 guests seated for dinner or approximately 90 with space for a dance floor. The farmer's porch can seat an additional 48 guests. The tent can accommodate up to 175 guests with space for a dance floor and band. Our room is not available for rent without using our in-house food services. All alcohol must be supplied by Southers Marsh Golf Club, as licensee in accordance with Massachusetts State Liquor Regulations. There are four options for onsite ceremonies - outside on the first tee, inside the tent, on the farmer's porch, or in the dining room. It is entirely possible to plan on an outdoor ceremony, and move inside the day of event if the weather does not cooperate. There are many options for wedding pictures, but one of our most popular is to take the wedding party up on the hill overlooking the golf course via golf cart. There is no additional fee for this service. Will the facility be available for a rehearsal? For weddings with onsite ceremonies, the facility can be available for a rehearsal. This can be set up through our function coordinator, Laura Flynn. We do not have a designated bridal changing room, however, you are more than welcome to use our office if you would like to. The deck is normally enclosed from November 1-April 30. It is a very time consuming process to put the enclosure up, so we try to take it down and put it up only once every year. By all means, we encourage our guests to come up with innovative ways to set their events apart. Please feel free to ask us if your ideas are feasible, or if we can think of any alternatives or other interesting ideas we have seen in the past. There are many variables that go into the price of your wedding. A typical wedding reception for 100 guests using the dining room and deck could be done for as low as $63 per person including all room fees, service fees, and MA meals tax. Please request more information for a wedding packet with complete pricing or a quote for your specific needs. For weddings, a non-refundable deposit of $1,000 is required to hold a date. An additional non-refundable deposit of 50% of the total estimated bill is due 6 months prior to the event. Because of the nature of the wedding business, and the fact that the vast majority of weddings need to be booked well in advance and require a lot of work prior to the event, all deposits are non-refundable. Wedding vendors need assurances that planned events are actually held, and using non-refundable deposits is our only way to protect ourselves. At Southers Marsh, we are forced to juggle the golf schedule with the wedding schedule because we only have one building. Consequently, we have a limited number of dates available for weddings. Having minimum dollar amounts for events ensures that we can at least break even on every wedding that we host. If you are hosting a smaller event or one that you feel will not reach our minimums, we would be happy to make recommendations of other area vendors who do not have this same problem. Although we have never done so, we reserve the right to change our prices without notice. Food costs, especially beef and seafood, can be extremely volatile and out of our control, and if need be, we may need to adjust our prices accordingly. If your numbers change, especially within 2 weeks of your event, please let us know as soon as possible. If we have not ordered the food yet or if it is a small change, we can most likely accommodate you. All minimums will remain in force, and once we order the food, you will be held to the number that you have specified. There is a cake service fee due to the time and particular skill required to dismantle a tiered cake, cut it to the serving guidelines of the bakery to insure that the right amount of pieces are cut, each piece with a frosting edge, plate and garnish the slices, and serve. Also we need to supply dishes, silverware, and extra time for waitstaff and dishwashers. There is a difference between weddings and other functions because of the amount of work it takes to put on a wedding both before and during the day of the event versus a business or social gathering. While a normal event may require one or two meetings to set up, a wedding can require 5 times that number. The day of the event, weddings require extra fixtures, such as place card, cake, and gift tables and linens, and extra staff to attend to the wedding party and ensure the timetable for the night goes smoothly. There are big and important differences between weddings and other events.